Are you ready for some Butterbows goodness?? It's dramatic and pretty and so encouraging! and also included written instructions to go with. Accessories: CAS-ual Fridays Stamps 4 Petal Set Fri-Dies, Big Shot, corner rounder, black thread/twine, black marker, kraft silky ribbon, foam dimensional. 1. Cut white yardstick piece 5 1/2” x 4” and stamp butterfly rainbow in red ink at far left edge. 2. Stamp butterfly rainbow again in orange ink, a little bit to the right of the first stamped image. Repeat again with yellow ink, then green ink, then blue ink, and finally purple ink, making sure to move image a little bit to the right with each new color. 3. 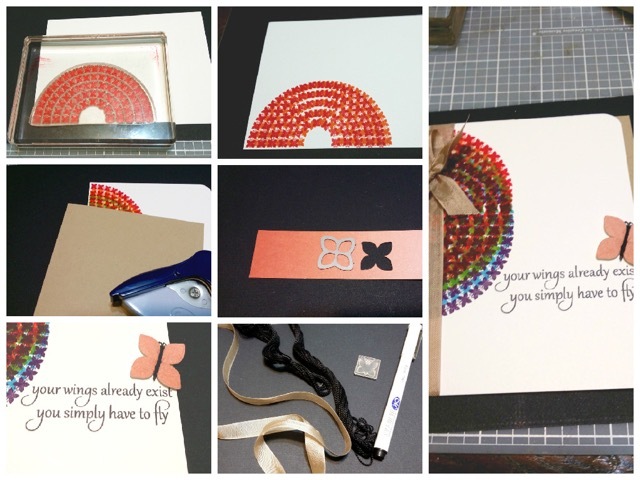 Make a Kraft cardstock base of 5 1/2” x 4”, and use corner rounder on top right corner of it and the white stamped piece, then adhere white piece to card front. 4. 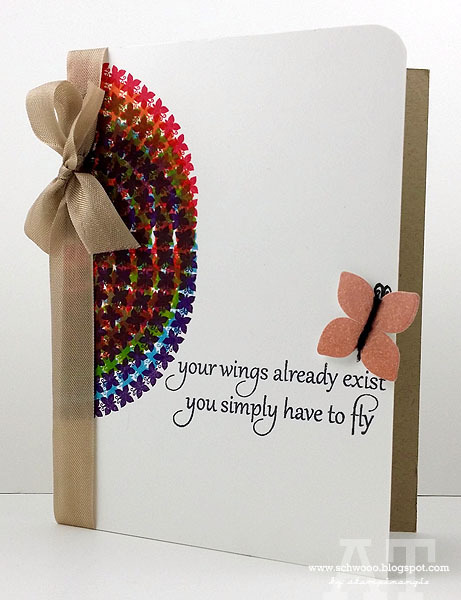 Use the larger 4-Petal Set Fri-Die with patterned paper to make your “butterfly”. 5. Stamp the sentiment in black ink at bottom right of card. Decide where to place your “butterfly”, and use black marker to draw black center line and antennae. (Use butterfly stamp as a guide to copy.) Attach your “butterfly” with foam dimensional, and add black thread/twine to center. I know you'll have fun with this one! This card is flutteringly beautiful and just bursting with vibrant color!! !